Long Beach alt-rock group Avi Buf­fa­lo was found­ed by then-high school stu­dent Avig­dor Zah­n­er-Isen­berg (whose nick­name, Avi, became the source of the band’s name). Zah­n­er-Isen­berg met the rest of his band and start­ed out, like so many oth­er groups, by post­ing songs on Myspace. After Avi Buf­fa­lo was noticed by Sub Pop, the band put togeth­er their debut album and on Tues­day released that self-titled intro­duc­tion. Avi Buf­fa­lo demon­strates some def­i­nite poten­tial on the part of the band - a hun­dred dif­fer­ent influ­ences mixed with some real cre­ativ­i­ty makes for an inter­est­ing debut, though the album cer­tain­ly has flaws. Front­man Zahner-Isenberg’s vocals, armed with a keen­ing edge, imme­di­ate­ly dis­tin­guish Avi Buffalo’s music, simul­ta­ne­ous­ly giv­ing it an emo­tion­al edge and (in his sharp­er moments) pro­vid­ing a clear con­trast to the soft­er instru­men­tals. Zah­n­er-Isen­burg tells the occa­sion­al­ly odd tales that pop­u­late Avi Buf­fa­lo with a del­i­cate but deep tone that he inter­rupts for the more ener­getic cho­rus­es of songs like “What’s in it for?.” When he’s accom­pa­nied by key­boardist Rebec­ca Cole­man, the vocals take on a fur­ther depth as their voic­es nice­ly com­ple­ment each oth­er as well as the instru­men­tals. Unfor­tu­nate­ly, from time to time, both slip into shrill­ness, which, though irri­tat­ing, is for­tu­nate­ly at least some­what inter­mit­tent. But shrill­ness aside, Zah­n­er-Isen­burg (and occa­sion­al­ly Cole­man) do a good job of nar­rat­ing Avi Buf­fa­lo’s sto­ries. A few are con­ver­sa­tions (if one-sided): “Jes­si­ca / Why do you always make it so hard? / You know I’m kid­ding / But some­times I feel like you’re all I’ve got,” while oth­ers are the rem­i­nis­cences that one might expect from a band like Avi Buf­fa­lo, with the slight odd­ness that the band’s lyrics seem to cul­ti­vate. In one exam­ple, Zah­n­er-Isen­burg sings of “strips of weari­ness in my rav­ing heart,” which, along with his descrip­tion of a pair of lips as “lit­tle strips of bacon” does a sur­pris­ing­ly good job at describ­ing exact­ly what he’s try­ing to get across, how­ev­er odd it may seem at first glance. 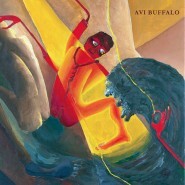 Avi Buf­fa­lo is not an amaz­ing album. The sound is gen­er­al­ly well devel­oped, and main­tains a very sol­id lev­el of den­si­ty, nei­ther to sparse­ly pop­u­lat­ed nor clut­tered, but Avi Buf­fa­lo is by no means devoid of sig­nif­i­cant dull areas through­out the album. Still, while this is by no means a top album, it’s a pret­ty sol­id debut album. The band mem­bers may not be in tune with one anoth­er (from a the­mat­ic, not tonal per­spec­tive), but that’s still excus­able as inex­pe­ri­ence with one anoth­er, at least in the set­ting of record­ing an album. All in all, Avi Buf­fa­lo is, more or less, a decent album.